What makes structural building components the best way to frame is the fact that, conceptually, they have been around for over 450 years. 1560-1580: Italian architect Ande Palladio developed three forms of the basic truss element—the rigid triangle. These forms are believed to be the earliest examples of trusses used scientifically. 1840: The Howe truss won a United States patent, and following Palladio’s work, became the earliest form of a simple truss created for long-span bridge construction. 1844: Thomas W. Caleb Pratt patented another combination wood and iron bridge truss. This truss differed from the Howe with diagonal webs of iron (for tension) and verticals made of wood. Modern day trusses came to fruition in the 1950’s, with the invention of the metal truss plate and concept of using it to connect pieces of lumber. 1952: A. Carrol Sanford invented the metal truss plate with teeth called the Gri-P-Late. 1955: Sanford’s Gri-P-Late thrilled Miami building officials, and he was issued the first Engineered Bulletin for his product by the Architectural Standards Division of the Federal Housing Administration on July 13. J. Calvin Jureit, founder of Gang-Nail Systems Inc. (now MiTek Industries), created the Gang-Nail plate, the first metal connector plate for trusses that did not need supplemental nail fastening. The plates were pressed into the lumber using a concrete vertical hydraulic press and steel table precision jigs. 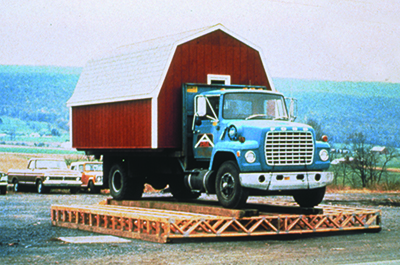 1958: Klaisler Manufacturing opened its doors as one of the first truss roller manufacturers. Late 1960s & Early 1970s: In 1970 the first total truss software package-Auto Truss-was developed for Gang-Nail Systems and in 1971 it became the first computer program offered to customers via time-sharing. Within a few years, these programs were converted to run on IBM 1130 computers, and other truss plate manufacturers followed Gang-Nail’s lead. 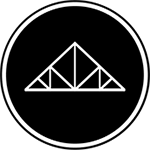 The first truss engineering computer software package was sold with the computer source code. Truss plate manufacturers provided truss manufacturers with Computer Aided Design (CAD) capabilities and the option to handle truss design in-house. Since the invention of the 2x4 in the 1830s, there has been no greater single force for creating change and improvement in American construction than the building component manufacturing industry. The invention of the first metal truss connector plate in Florida in 1952 marked the beginning of the industry that in just over five decades has vastly changed home, apartment and commercial building construction. These changes benefit all who are involved in the construction chain – the building designer, the builder, and the residential or commercial building owner. Roof trusses are the main product of building component manufacturers. Of the nearly 2,000 component manufacturer locations who, in recent years, have flourished or waned in the changing United States construction market, virtually 100% produce this component. Today, according to information from SBCA members, about 60% of the manufacturers also make floor trusses, and about 30% make wall panels. The building components industry continues to expand. The industry has over 1,800 manufacturing locations, employing over 80,000 workers and boasts over $6.1 Billion in sales. For the most current industry financial information visit www.sbcindustry.com. In 1952, the late A. Carroll Sanford, founder of Sanford Industries in Pompano Beach, Florida, invented his metal truss connector plate. This launched the industry and changed the way buildings are constructed. 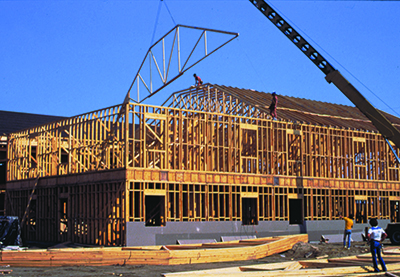 A 1999 market research study performed by the National Association of Home Builders (NAHB) for the Wood Products Council in cooperation with The USDA Forest Products Laboratory (FPL) indicates that roof trusses are used in 58% of all residential and 71% of all multifamily construction in the U.S. Component manufacturers also blazed the computer trail for the construction industry. They were the first to adapt the new technology to speed the roof truss engineering process. Early on, component manufacturers discarded the slide rule in favor of the computer to grapple with all of the factors involved in truss design, such as geometry and cutting, plate size and steel gauge, lumber grades, spans, live and dead loads, plus wind and snow loads, and other geographical factors. 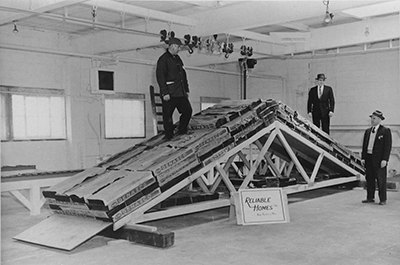 Inevitably, computers were also used to develop floor trusses, which were invented in 1970 by Jack Schmitt of Walled Lake, MI, as well as wall panel and complete house designs and layouts. In short, the component industry brought the age of computers into home and commercial building construction. The encyclopedias of engineering knowhow built into the component industry’s specialized computer programs allow component manufacturers to scientifically design, lay out and cover every detail of truss construction – including safety considerations – with utmost speed and accuracy. Spearheaded by the innovations of component and truss plate manufacturers, as well as by manufacturers of machinery for truss and wall panel production, the building component industry today is continuously enhancing and refining the computer technologies that improve the way we build. Today, sophisticated component saws multi-blade units that cost over $200,000 – run all day long cutting lumber, controlled by a computer. Likewise, computers create paper and mylar templates for wall layouts on panel machines, which guide workers in the placement of members on wall panel machines. While the major truss plate and machinery suppliers continue to improve the software they offer their component customers, literally hundreds of component manufacturers have refined their software systems. Combined with independent suppliers of software that are cropping up and marketing their products, the interest in engineering design software systems is accelerating improvements in software development on a continual basis. Because engineered building components offer benefits for everyone in the construction chain – architect and designer, builder, and building-buyer alike – it took just a little more than two decades for truss products to spread completely across the United States. Attractive and functional design is the architect’s stock-intrade for his or her structure, whether residential or commercial. Architects today enjoy free rein in building design because of their confidence that component manufacturers will be able to duplicate in construction the designs they put on paper. As recently as 30 years ago, almost all houses were roofed with simple, triangular fink trusses. Now, some single home designs may use as many as 100 different kinds of roof trusses to give the building interesting roof lines as well as arched, vaulted, and coffered ceilings. Sophisticated engineering systems allow component manufacturers to quickly and confidently produce what architects design. In addition, should an Architect or Building Designer err in Engineering, Design, load development, layouts, or material optimization, these same computer systems may allow component manufacturers to uncover the error and recommend a solution long before any blunders become costly at the job site. Engineering safety-margin factors and code provisions are built into the software for any structures under design. Often, with the participation and approval of the Building Designer, component manufacturers can also suggest ways to reduce the cost of a structure, by using dimensions that make the best use of common building materials. Though builders are probably among the most reluctant to change their practices, the advantages of using trusses and other engineered building components at the job site have eliminated their objections. Components allow builders to create higher quality buildings in less time, at less cost. Using components, some builders have been able to double the number of structures they can complete in a given time as compared to piece-by-piece construction at the job site. For example, construction of a home at a job site using the old fashioned stick framing method generally requires six months to as long as a year, while the same house can be framed three to four times faster using components, and can be finished in as little as one to three months. The advantages of component construction have been illustrated dramatically. 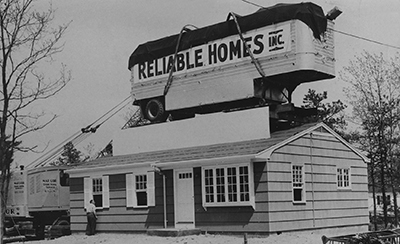 In 1985 a component manufacturer in New Jersey built duplicate homes – one stick-built and the other component-built. The component home framework was erected three and a half times faster at a savings of more than $1,500 in labor. Similarly, in 1996, SBCA and the Building Systems Council of the NAHB erected two identical 2,600 sq ft houses at the NAHB’s annual trade show in Houston, TX. One was constructed using conventional stick-framing practices while the other used trusses in the roof and floor, and panelized walls. Once again, the component house was erected nearly three times faster than the conventionally framed house, at a savings of over $3,300. The study was later recreated in 2015, where similar results were reported. A detailed description of this project, entitled “Framing the American Dream can be found online at https://www.sbcindustry.com/fad. Today, the vast majority of site builders realize the multiple advantages of using components. And, the more components they use, the greater their savings. Builders not only achieve a better quality home, built much faster, they also benefit from improved quality, weather-protected materials, much smaller cleanup costs, less exposure to pilferage and vandalism, less need for job site labor, lower worker’s compensation costs, and higher-value construction for their customers. The buyers of component-built structures also receive benefits that cannot be duplicated by site-built structures. The roof systems of homes engineered by component manufacturers, for example, are scientifically designed for strength to support not only live and dead loads, but other loads as well, including snow, wind and seismic loads. The wood members cut by component manufacturers are accurate to within hundredths of an inch, the roof and floor members are joined with embedded metal plates, and the walls are fastened with calibrated pneumatic tools, giving home owners engineered structures that far exceed the quality that could be achieved with conventional tools on the job site. What’s more, because component software technology has given architects more creative freedom in their designs, buyers obtain homes and commercial buildings with lasting appeal, which appraise at high value, and appreciate faster. Where is the component industry headed? In the past few years, new techniques and technologies have come about at a “revolutionary” rather than “evolutionary” pace, making it virtually impossible to foresee the shape the component industry will take in the future. In addition to computer control of saws and jigs (patterns) for trusses, component manufacturers have also begun using laser patterning systems for roof trusses floor trusses, and wall panels. Inarguably, one of the highest growth industries worldwide is in computer hardware and software technologies, and because these technologies have become an integral part of the component manufacturing industry, component manufacturers will be among the first to adopt and benefit from technological advancements. However, it will be the commercial building and home buyers, rather than the component manufacturers, who will be the ultimate beneficiaries of innovations in technology that continue to revolutionize the output of America’s building component factories. Over the last five decades, the component industry has been responsible for driving innovations in construction practices that have seemed like evolutionary miracles. However, with the speed at which technological breakthroughs are occurring, it seems likely that innovations in the component industry are also bound to continue and accelerate.